In this small post, I'm going to show how I used Functional Reactive Programming (FRP) to improve the GUI part of the small application presented in the previous post. The best article to read on the subject is Deprecating the Observer Pattern (DOP). This article explains what are the drawbacks of using a listener-based approach to components communication in a user interface and proposes FRP as an alternative. They are actually 2 sides of the same coin (more or less) as explained in this video: from an EventStream you can get a Signal by holding the last emitted value and from a Signal you can get an EventStream by getting all the changes. But how is this helpful for GUI programming? The hard reality of Swing GUI components is that they are really mutable at heart. Once you compose a GUI with components (say a Frame) containing other components (say a TextField), then, when anything happens in your application, you mutate the innermost components heavily (by changing the text color for example). When you add publish/subscribe mechanisms on top of that, you add even more developer-managed mutability since you need to add-remove listeners to the whole graph of components. It is also not very easy to understand how events "flow" between components. Let's see that more precisely in the context of my simple application. This means that when you open a file using the OpenFileMenuItem you're providing new File events which other components can react on, and when you invoke the CountAction you, well,... you just pressed the button, there's no meaningful value to convey, so the Unit type is appropriate here (the clients just want to know that something happened). First we do a bit of filtering, because we just need the file path as a Signal[String] (using hold to transform the stream to a signal, with an empty initial value). Then we declare that we need to do a count whether there's a distinct change in the file path value, or (|), if the user pressed countAction button. For each doCount event we flatMap it (actually we forget about it,...) and we use the current value of the filePath to count the number of words. The expression computeValue.inBackground computes a value using the SwingUtils.invokeLater method to avoid computations being done on the event dispatch thread (this might cause grey screens). The inBackground method returns an EventStream[T] to signal consumers that the value is ready. The important line is the last one where we declare that for each message event, we change the text attribute of the TextField to the new value m.
// the whole `OpenFileMenuItem` component acts as an `EventStream[File]`. The `FilePoller` uses a `path` signal regularly. If the underlying file is modified, a notification event is triggered. I don't know about you but I really find nice that the abstractions in my implementation give me hints about what the application could do! For me this is a good sign that FRP is really well-suited for the job of GUI programming. You can access the application project via github. I can do that in 2 hours! That's more or less what I told my wife as she was explaining one small problem she had. My wife is studying psychology and she has lots of essays to write, week after week. One small burden she's facing is keeping track of the number of words she writes because each essay must fit in a specific number of words, say 4000 +/- 10%. The difficulty is that quotations and references must not be counted. So she cannot check the file properties in Word or Open Office and she has to keep track manually. For example, she may write: "... as suggested by the Interpretation of Dreams (Freud, 1905, p.145) ...". The reference "(Freud, 1905, p.145)" must not be counted. Or, "Margaret Malher wrote: "if the infant has an optimal experience of the symbiotic union with the mother, then the infant can make a smooth psychological differentiation from the mother to a further psychological expansion beyond the symbiotic state." (Malher cited in St. Clair, 2004, p.92)" (good luck with that :-)). In that case the quotation is not counted either and we must only count 3 words. Let's see now how Scala helped me with those 3 tasks. The idea behind parser combinators is very powerful. Instead of building a monolithic parser with lots of sub-routines and error-prone tracking of character indices, you describe the grammar of the text to parse by combining smaller parsers in many different ways. I'm now just going to comment on a few points regarding the TextParsing trait which is parsing the essay text. If you want to understand how parser combinators work in detail, please read the excellent blog post by Daniel Spiewak: The Magic behind Parser Combinators. The page parser above can recognize page numbers like p.134 or p.1 but it will also accept p134. You can argue that this is not very well formatted, and my wife will agree with you. However she certainly doesn't want to see the count of words being wrong or fail just because she forgot a dot! The plan here is to display what was parsed so that she can eventually fix some incorrect references, not written according to the academia standards. We'll see, in part 3 of this series how we can use another parsing library to manage those errors, without breaking the parsing. One more important thing to mention about the use of the RegexParsers trait is the skipWhitespace method. If it returns true (the default), any regex parser will discard space before any string matching a regular expression. This is convenient most of the time but not here where I need to preserve spaces to be able to count words accurately. The next big chunk of this application is a Swing GUI. The Scala standard distribution provides a scala-swing library adding some syntactic sugar on top of regular Swing components. If you want to read more about Scala and Swing you can have a look at this presentation. 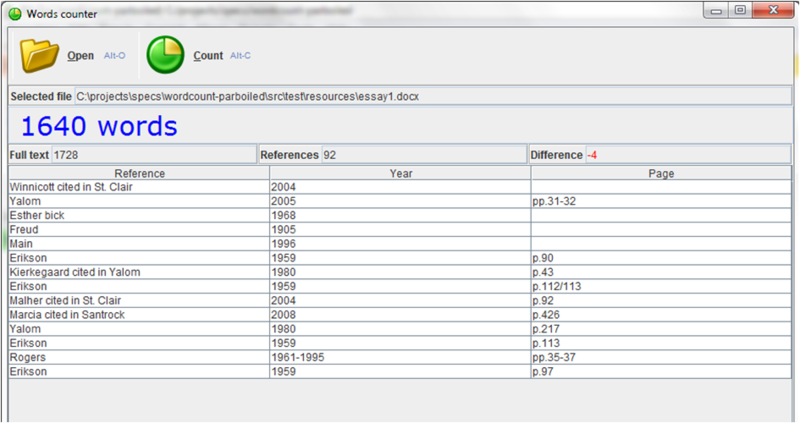 count example, note that the parsing is not perfect since the word counts do not add up! This is nice but I think that there is a some potential for pushing this way further and create more reusable out-of-the-box components. For example, I've created an OpenFileMenuItem which is a MenuItem with an Action to open a FileChooser. Also, something like a pervasive LabeledField with just a label and some text would very useful to have in a standard library. I also added a bit of syntactic sugar to have actions executed on a worker thread, instead of the event dispatch thread (to avoid grey screens), using the SwingUtilities.invokeLater method. For example: myAction.inBackground will be executed on a separate thread. Eventually, I was able to code up the GUI of the application pretty fast. The only thing which I didn't really like was the Publish/React pattern. It felt a bit messy. The next part of this series will show how Functional Reactive Programming with the reactive library helped me write cleaner code. I anticipated this part to be a tad difficult. My first experiments of text parsing were using a simple text file and I knew that having the user (my wife, remember,...) copy and paste her text to another file just for counting would be a deal-breaker. So I tried to read .odt and .docx files directly. This was actually much easier than anything I expected! (xml \\ "p") map (p => (p \\ "t").map(_.text) mkString "") mkString "\n"
For further details you can read the code here. That's it, parser combinators + scala-swing + xml = a quick app solving a real-world problem. In the next posts we'll try to make this even better!